Name any current major conflict in the world, domestic or international, and there is likely at least one graduate on location, employing the analysis and peacebuilding tools learned while studying at Eastern Mennonite University’s Center for Justice and Peacebuilding (CJP). As of September 2017, some 603 individuals – including 78 Fulbright scholars – have received a graduate certificate and/or MA degree from CJP. That influence is visible in the 2017-18 issue of the annual Peacebuilder magazine, which highlights CJP’s programs: MA degree programs in conflict transformation and restorative justice, as well as Strategies for Trauma Awareness and Resilience (STAR), Summer Peacebuilding Institute, Women’s Peacebuilding Leadership Program, and the Zehr Institute of Restorative Justice. Two graduates assisted in a national mapping exercise to gather data about the nature and extent of current truth-telling, racial healing, memorialization and social transformation initiatives. The Zehr Institute was awarded a $104,000 grant to lead a national process aimed at identifying the most strategic areas to invest in order to support the restorative justice movement. New offerings at SPI in 2017 included four courses that directly addressed how to manage and transform divisive rhetoric and communication; how to bring polarized communities together and organize for change; and how to recognize and analyze systems of oppression. Additionally Carl Stauffer’s truth-telling, reconciliation and restorative justice course – co-taught with Dr. Nicholas Rowe – drew 24 participants. Mennonite Central Committee representatives talk about how STAR (Strategies for Trauma Awareness and Resilience) trainings have “transformed the front lines” of Syrian and Lebanese staff, church leaders and other caregivers working with refugees. Graduates of the Women’s Peacebuilding Leadership Program in Kenya form a network to influence middle-level civil society space. Myriam Aziz ’17 returns as a teaching fellow to EMU. Dr. Jayne Seminare Docherty outlines creative change and new learning spaces in the academic programs at CJP. 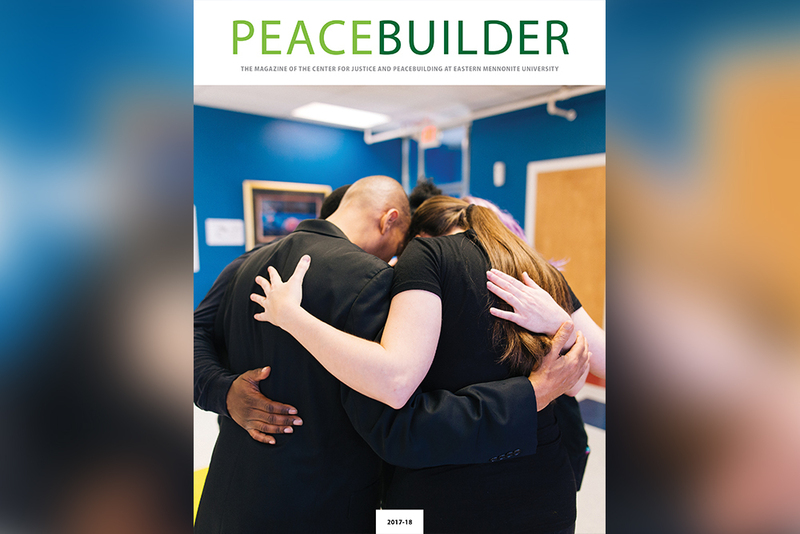 Peacebuilder magazine is housed at www.emu.edu/now/peacebuilder. The site also includes professional profiles of CJP alumni, who are encouraged to update their profiles regularly.